Radiation is everywhere! Lucky for us the Earth’s magnetic field protects people on the planet from this radiation by trapping the particles in radiation belts that surround the globe. These areas in space are called Van Allen belts and lie up to 36,000 miles from the Earth’s surface. In Earth’s orbit astronauts are protected but anything beyond they are at risk to these cancer-causing agents. Radiation is major roadblock especially for longer missions of prolonged space travel such as a mission to Mars. At this point it seems inevitable that humans travel to Mars and scientists are testing every aspect of the journey but unless we figure out how to deal with this radiation all of this preparation will be for nothing. Astronauts have to content with two types of radiation. The first is composed of galactic cosmic rays, high-energy particles that travel close to the speed of light. These cosmic rays can damage human DNA, trigger mutations and change gene transcription. When gene transcription occurs the RNA produced carry imperfect instructions to the cells, long term these errors can become permanent mutations. Scientists at Wake Forest Institute for Regenerative Medicine performed a study to find the effects radiation from a Mars mission might have on astronauts. They found Leukemia, a quickly developing form of cancer, would pose a major issue to the astronauts health during the two-year mission. To prevent this form of radiation Scientists are looking to both internal and external means of protection. This same team states that a daily oral vitamin might be able to restore about 75 percent of the potential of the cells if given to them before the exposure to radiation. One problem they have run into during testing was that the pill isn’t absorbed well orally so they might have to find other ways to implement this. StemRad, an Israeli company specializes in radiation protection for nuclear workers, has designed a vest that will protect astronauts from space radiation. Organs, tissues, and stem cells are the most vulnerable parts of the body and they have created a test that is designed to specifically shield these areas. Spacesuits already seem to be very uncomfortable and clunky, I imagine a large protective vest on top of this worn around the clock would add be unfavorable. StemRad aims to tailor each vest to each astronaut for maximum flexibility to combat this issue. The company announced on March 3rd of 2017 that the vest will be on Exploration Mission-1, the unmanned test of NASA’s Orion scheduled for launch in 2019. Two dummies will fly aboard the capsule with only one wearing StemRad’s vest. On recovery, NASA will perform test on each dummy to determine the vests effectiveness. There is also another type of radiation that will pose a risk to the astronauts and this is solar radiation. This form of radiation is emitted from the sun as energized particles. Unlike the cosmic rays, these particles are discharged from weather events such as solar flares and affect astronauts acutely short term damaging the central nervous system and resulting in impaired motor and cognitive function. As you can see this form of radiation compromises the mission as the astronauts would most likely die before reaching Mars. 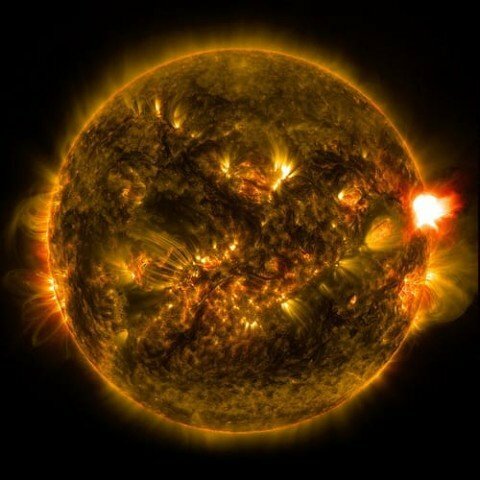 It seems the most likely way the astronauts will avoid this radiation is through radiation sensors that could warn them of solar flares about an hour before they reach them. With this warning system the astronauts could take shelter in the spacecrafts cargo area protecting them from the bulk of the radiation. Protecting astronauts from these forms of radiation should be the primary objective over the next few years to ensure a successful mission and hopes of Colonization. Deadly Space Radiation by Charlie is licensed under a Creative Commons Attribution-ShareAlike 4.0 International License. The world is very fantastic because we can see how the world protect the human and animal and any sometimes that live in the world.